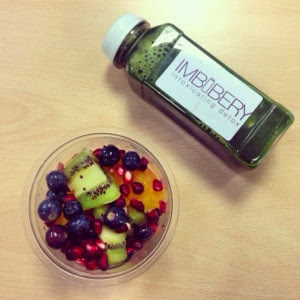 Imbibery's detox juices are raw, cold-pressed and unpasteurised. Simply put, this little bottle is packed full of plant goodness. I tried their Chloro mixture, which contains spinach, cucumber, celery and ginger. 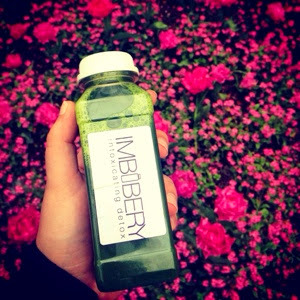 The juice is brimming with chlorophyll (the dark green pigment found in plants and algae) which studies have found increases the quality and quantity of red blood cells and aids digestion. It also contains ginger, which prevents flatulence and soothes intestinal tract. Made by the messy method of pressing, this juice is extracted from vegetable pulp simply with pressure, rather than heat. By extracting in this way cold-pressed juices contain more vitamins, minerals and enzymes due to the fact that they are never heated. 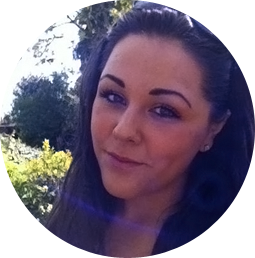 I've started replacing my morning coffee with raw juices and smoothies and have found myself with bags more energy and healthier looking skin.